There is a severe shortage of skilled occupational therapists in Cambodia. If you are currently an occupational therapy student or have recently qualified, you could help provide much-needed treatment to babies, children, and adults with a wide range of physical problems as a Projects Abroad Occupational Therapy intern in Cambodia. Occupational Therapy is not a recognized profession in Cambodia, so interns work closely alongside Physiotherapy interns to provide help and support to the patients. As an Occupational Therapy intern you therefore need to be pro-active and make sure the local staff are informed of the work you are capable of doing. You will work independently and having specialized skills or an interest in working with disabled people would serve as an advantage. You must have completed at least one year of related studies or training by the time you join the project. If you have completed at least a year of occupational therapy related studies (but less than three years), you will have the opportunity to work at a centre that cares for babies and children who have a variety of physical or mental disabilities. The centre accommodates children from the city and other provinces, most of whom are vulnerable and require constant care. It is important that you have a positive attitude and a willingness to help disabled children. If you have studied occupational therapy for at least three years, you also have the option to work at a centre for child and adult patients living with disabilities and those affected by HIV. Unfortunately, most of the patients have never been officially diagnosed and some have not received any treatment whatsoever. While the local staff work are extremely dedicated, the centre would greatly appreciate your help in this department. At this placement, you will be expected to work independently. Having specialized skills or interest in working with disabled people would serve as an advantage at this placement. Recently qualified occupational therapists would also be welcome. While interning as an Occupational Therapist in Cambodia you will live in one of the Projects Abroad apartments with other volunteers. You can spend your free time exploring Phnom Penh and the surrounding region with other Projects Abroad volunteers. 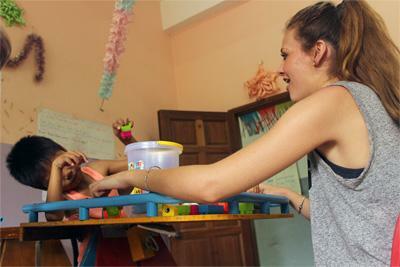 Occupational Therapy internships in Cambodia are available for shorter periods than 4 weeks. While you will be able to gain valuable medical experience on a short-term trip, we recommend staying for a longer period to allow yourself more time to get to know the local medical system, see more of a variety of conditions and procedures, and develop stronger relationships with local medical staff.